One of my favourites! Get a fresh fish from the wet market and do it the same night, I promise you this is a heavenly dish. Light marinade sauce, easy cooking and easy to remember steps. Ever since I manage to try this particular new wet market stall that sell fresher seafood, this dish is a must-have! Clean and pat dry the fish. Rub salt on each side of the fish and stomach too. Place a slice of ginger into the stomach area. Make 3 cuts on each side of the fish as this will allow easy cooking of the fish. 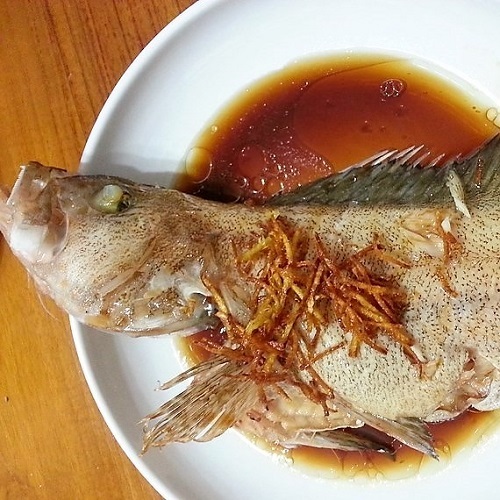 It will also be convenient for you to see if the fish is thoroughly cooked. Rubbing salt removes the fishy smell and also gives a better flavour. Mix all the sauce ingredients in a small bowl and place it next to the fish on the steaming plate. I steam them separately so that the steaming liquid can be thrown away as it can affect the flavour of the sauce and make it cloudy. Using rock sugar also enhances the flavour and gives the sauce a distinct taste. Bring water in the steamer to a boil and steam over high heat for about 11-12 minutes. If the fish is bigger, you may want to steam it slightly longer but not too long till the fish is hard and tough. While the fish is being steamed, prepare your shallot oil by frying 1 shallot with oil. Be careful not to burn it. If you have already prepared shallot oil beforehand, heat up the oil. 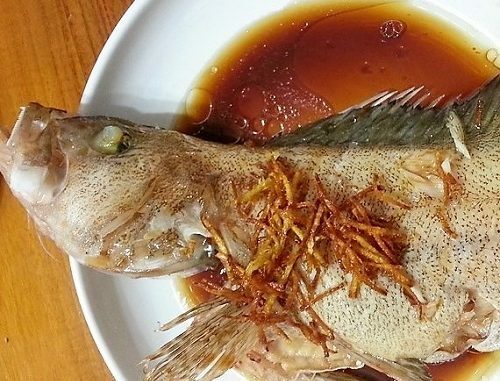 When the fish is cooked, remove from steamer and pour away liquid and remove the ginger slices from the steaming plate. Pour the steamed sauce (placed with the fish) over the fish and then pour the shallot oil over. Garnish and serve. I promise this dish will be unforgettable.